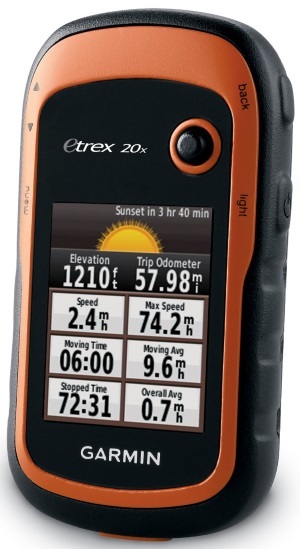 See the Way - eTrex 20x has an enhanced 2.2-inch, 65K color, sunlight-readable display. Durable and waterproof, eTrex 20x is built to withstand the elements. It has an upgraded interface yet retains its legendary toughness to withstand dust, dirt, humidity or water. Go Anywhere - With an array of compatible mounts, eTrex 20x can be used on your bicycle, boat, in your car or motorbike and off-road vehicle. You even get turn-by-turn directions with the auto mount and City Navigator® NT maps. Wherever you think you might take eTrex, it has the mapping and mounts to get you there. Keep Your Fix - With its high-sensitivity, WAAS-enabled GPS receiver and HotFix satellite prediction, eTrex locates your position quickly and precisely and maintains its GPS location even in heavy cover and deep canyons. Add Maps - With its microSD™ card slot and expanded 3.7 GB of internal memory, eTrex 20x lets you load TOPO 24K and Garmin HuntView ™ and hit the trail, plug in BlueChart® g2 preloaded cards for a great day on the water or City Navigator NT map data for turn-by-turn routing on roads. 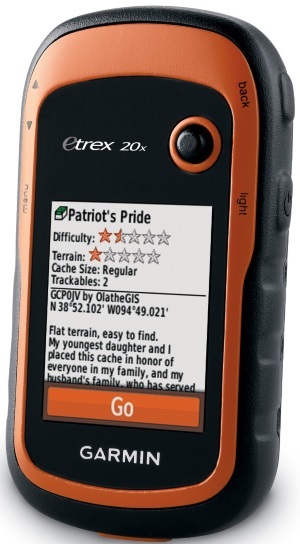 eTrex 20x also supports BirdsEye Satellite Imagery, that lets you download satellite images to your device and integrate them with your maps..
Find Fun -eTrex 20x supports geocaching GPX files for downloading geocaches and details straight to your unit. Visit Geocaching.com to start your geocaching adventure. By going paperless, you're not only helping the environment but also improving efficiency. eTrex 20x stores and displays key information, including location, terrain, difficulty, hints and descriptions, which means no more manually entering coordinates and paper printouts. Simply upload the GPX file to your unit and start hunting for caches. Go Global -The eTrex series is the first-ever consumer-grade receivers that can track both GPS and GLONASS satellites simultaneously. When using GLONASS satellites, a system developed by the Russian Federation, the time it takes for the receiver to “lock on” to a position is (on average) approximately 20 percent faster than using GPS. And when using both GPS and GLONASS, the receiver has the ability to lock on to 24 more satellites than using GPS alone. Plan Your Next Trip - Take charge of your next adventure with BaseCamp™, software that lets you view and organize maps, waypoints, routes, and tracks. This free trip-planning software even allows you to create Garmin Adventures that you can share with friends, family or fellow explorers. BaseCamp displays topographic map data in 2-D or 3-D on your computer screen, including contour lines and elevation profiles. It also can transfer an unlimited amount of satellite images to your device when paired with a BirdsEye Satellite Imagery subscription. Garmin Australasia is pleased to announce the new eTrex series. Garmin eTrex, a recognisable name in the outdoors, has been embraced by the market for over a decade, selling millions of units. 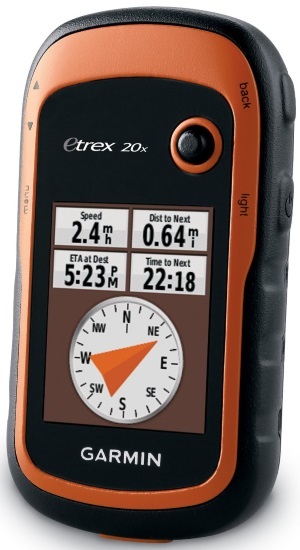 The newly redesigned eTrex lineup will retain the core functionality such as rugged construction and long battery life that made eTrex famous, while adding capabilities normally found in premium handhelds. An already easy-to-use device has gotten easier thanks to an improved user interface complimented by an “updated” look with refinements such as buttons identified by text. for sharing waypoints, tracks, routes and geocaches. 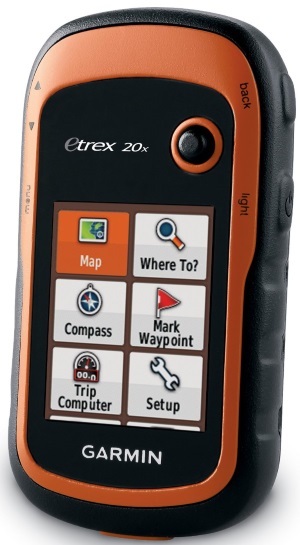 Customers are able to use the internal memory with the microSD™ card slot on the eTrex 20 and eTrex 30 to add TOPO New Zealand and Australia, road and marine mapping options. Small in size, but big on features. The new eTrex are the perfect companions for all of your outdoor adventures.